Stainless Steel material ensuring quality and longevity. 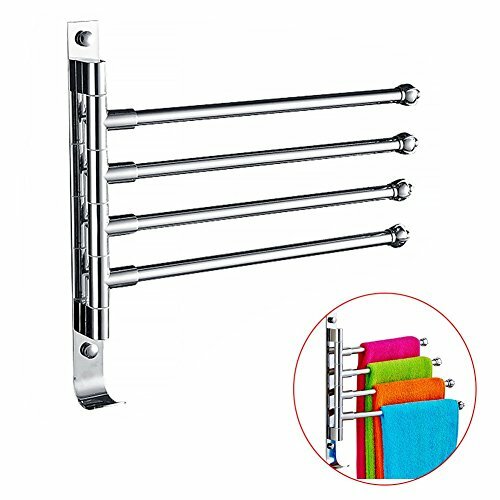 Perfect for hanging and organizing your face towel, bath towels and clothes etc. Easy to install the towel rack on the wall with the included mounting hardware, to save space. The bottom of the rack adds hooks, the rack using anti-skid design making it more convenient. 4-bars support multiple use, can rotate 180 degrees. Size: (L*H) About 31*29.5 cm, Gap: About 5 cm. Size: (L x H) About 31 x 29.5 cm, Gap: About 5 cm.；4-bars support multiple use, can rotate 180 degrees. WIDE APPLICATION - Works on a variety of surfaces, like wood, tile, and more (Not suitable for unsmooth wallpaper.) Ideal for bedrooms, bathrooms, closets, cabinet, kitchen, office, armoire and so on to save space and organize your space in neat. EASY TO INSTALL - Wall mounted design save a space; ONE piece, NO assembly required. Hardware pack included. If you have any questions about this product by Feian, contact us by completing and submitting the form below. If you are looking for a specif part number, please include it with your message.